How Versatile are the Angle Grinder Uses? Home >> Tools >> How Versatile are the Angle Grinder Uses? Some might think that an angle grinder is just an ordinary tool having a close relation with heavy construction. However, the truth tells something reverse. Don’t you know that the tool comes with multiple functions? If you plan to cut tough materials, you must need this. Therefore, what are the angle grinder uses in daily life? For the details, check this following information out! 1. What is a Grinder? An angle grinder basically refers to a power tool that is commonly handled. Coming with some names like disc grinder and side grinder, this sharp equipment is applied both for polishing or abrasive cutting and even for sanding. To operate the grinder tool, you may find it powered by a petrol engine and electric motor. It is equipped with a guard easy to adjust. Another type with particular speed range is used to smooth a surface involving sandpaper. Unlike its forepart full of metal-based materials, the backing section consists of hard plastic. 2. How to Use a Grinder? The usage of an angle grinder, in fact, depends on the purpose of cutting. To divide the rebar, start the step by adjusting the metal cutoff wheel on the tool. After switching on the cutting machine, don’t miss out on putting up the rebar and holding it safely. Since the operation is through holding; that’s why its nickname is hand grinder. Then, drop the whole slowly yet surely on the metal piece. To score the tile, the early thing you need to do is by adjusting the grinder with the diamond blade. If it’s done, score the surface with the running tool. When it comes to the key use of an angle grinder, some already knows that the tool has a function to divide the metal-based material. Unless you don’t have a metal workshop, you must be familiar with the tool’s efficiency. A hacksaw possibly can do this job – but it, for sure, takes a length of time and what’s more, you have to gives an extra effort for cutting. 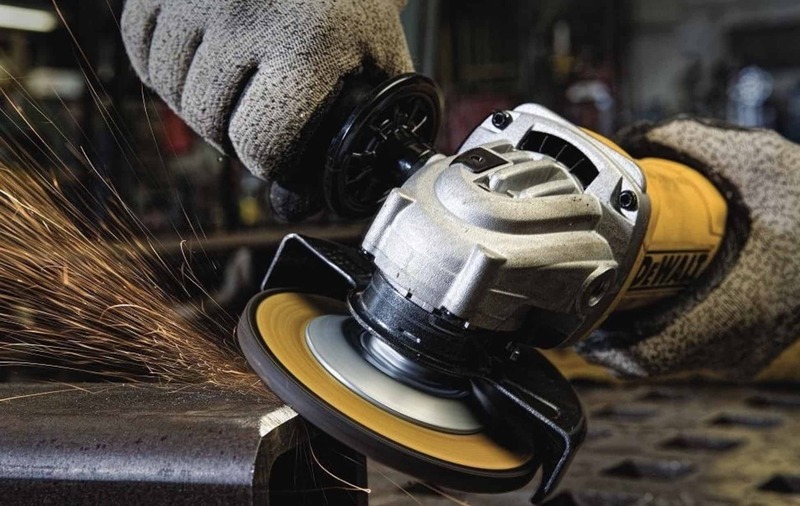 The operation of an angle grinder is arguably trouble-free. Ensure to place the shiny bar and let it stay still. Moreover, don’t forget to adjust the device with a metal cutting blade or wheel. In addition to cutting the metal off, an angle grinder is pretty handy in trimming other rigid materials such as concrete, tile, as well as stone. During the carrying out, always stay safe and careful as the object are considered heavy. The choice of the cutting blade can’t be at random. Look high and low for a fine-quality option way much stronger. Our recommendation goes to a dry cut diamond one. Although it costs more high-priced, this brand is somehow more efficacious and long-lasting. Is your metal covered with grime and rust? Instead of applying some chemicals, there is no way better other than cleaning it with the angle grinder. The procedure of the clean-up, at the bottom, shares an affinity with the cutting way. The additional device to mount is simply the wire cup brush (another alternative could be a wire wheel). If the dirty area is found to be vast, never hesitate to apply the wire cup brush. Meanwhile, the wire wheel is highly applicable to the one that’s relatively limited. Not only is the angle grinder (we mean the metal grinder) great as a cleaning agent, but the modified, recently developed tool – turning out – can be used to polish the stone. Arguably, it’s known as one of the efficient stone cutting tools. The method to go is quite simple. Just trim the outer part of the stone with a moderate blade. Be careful while doing this job. For better protection, you might put on a face shield as well as gloves. The particle of dust sending out from the cutting process is highly possible to disrupt your breathing system. Do you find your fireplace is getting old and its mortar joins experience physical damage? This kind of general issue takes place due to some factors mainly the weather condition. There is nothing to get worried though as you can take the full advantage of your angle grinder. To solve this, you need to have a go with the tuckpointing method. Some of you might have no clues regarding the term; tuckpointing is a process of repairing a construction by ceasing the destructive process. For the blade choice, our recommendation remains the same – the diamond sort. It’s also called a diamond tuckpointing wheel. When it comes to performing this simple procedure, you need to ensure that you don’t harm the brick. That’s why you are required to hold the handle properly and carefully take over the beneficial tool. Your old paint sticking to an object hard to remove? Keep using the angle grinder to finish the matter. When the removing procedure is highlighted, be sure to make use of both the wire wheel and wire cup brush. When the spinning brush reaches the painted surface, the residue slowly falls off. Compared to apply the traditional brush, this tool-based way is, as a matter of course, eminent than the conventional one. Additionally, you don’t spend much energy with the angle grinder. Getting mad because your lawn mower can’t work properly? The problem usually arises as your grass-trimming tool becomes blunt. The way to solve this is nothing else but sharpening the metal. You don’t need to call a professional to do this task and again, benefit your angle grinder instead. To carry out the sharpening process, you have to embed your lawn mower’s blade without leaving out the clamp first. Afterward, switch on the machine, get it closer to the blade, and sharpen cautiously. To make a long story short, the angle grinder uses are highly versatile. You have to underline that it’s not only used for a cutting purpose, but the device can be run for polishing stone, getting rid of mortar, and not to mention sharpening a blade.